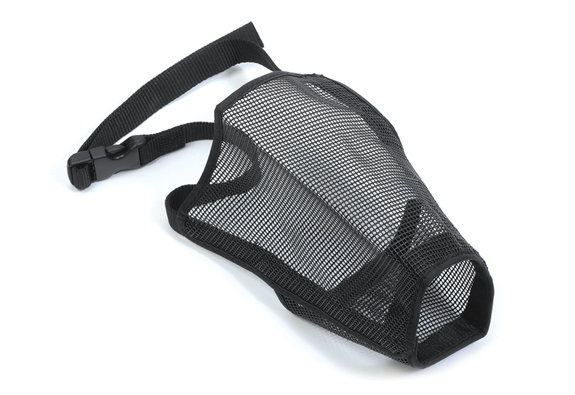 The Ancol Nylon Mesh Muzzle is comfortable to wear, fits well and allows the dog to drink and pant safely. 0 Tiny dogs, e.g. Yorkies, Miniature Poodles, Miniature Dachsunds. 1 Wippets, Wesh Highland Terriers, Jack Russells, Dachsunds, CKC Spaniels. 2 Border Collies, Beagles, Springer & Cocker Spaniels, Standard Poodles. 3 Labradors, Boxers, Germand Sheperds, Dobermans, Setters, Retrievers, Bull Terriers. 4 XL Extra large examples of Rotweilers, Bull Mastiffs. 5 Wolfhounds, Great Danes, Pyraneans, Bloodhounds, St. Bernards. 5 XL Extra large examples of Wolfhounds, Great Danes, Pyraneans, Bloodhounds, St. Bernards. Below are some recent questions we've received regarding Ancol Dog Mesh Muzzle, including answers from our team. Our Airedale seems to eat anything and everything from chewing gum to tissues on the street to mussels and shells on beach. Would this muzzle keep these things out of reach? This muzzle will give your dog enough room to drink and take treats from the ground so it may not stop your dog also picking up unwanted items off the floor. A good muzzle which will prevent this behavior would be the Ancol Plastic Dog Muzzle as this muzzle has small holes in the plastic. They are big enough to allow treats to be pushed though as a reward, but small enough to stop the dog from picking up items. The muzzle will stop your dog from opening its mouth so it wont be able to howl. Does this product stop dog from opening mouth wide enough to eat sticks ,grass basically anythingMy dog has chronic pancreatitis and MUST avoid eating anything other than the food we give him. Thank you for your question. I have spoken to Ancol who say they cannot guarantee that a dog wouldn't be able to eat anything with this muzzle as it is open at the end to allow for drinking/panting so there may be a chance they could pick something up with their tongue. Do I measure from the bridge of the nose, or the back of the head? You need to measure the nose circumference and the nose length (from the end of the nose to the start of the face). How do I measure my dogs nose to fit this muzzle? She is a Staffie cross who doesn't like other dogs. But is fine with people. We have a size guide on the product page in the description section. You'll need to measure the circumference of your dog's nose and also the nose length, then match this to the size recommended. To give you an idea, the manufacturer has a list of recommended sizes for certain breeds, and bull terriers often fit the size 3 (circumference 20cm, length 15cm).